The Mars Science Laboratory — also known as MSL, or Curiosity — is the most sophisticated Martian vehicle that NASA has ever built. And it's set to launch for the Red Planet tomorrow. The rover's primary objective is to assess whether Mars is, or ever was, capable of sustaining life. Weighing in at almost 2000 pounds, the MSL is more massive than the agency's last three Mars rovers put together, making it large enough to haul around some of the most technologically advanced equipment humans have ever put into space. Let's take a peek under the hood of the rover that could soon redefine the way we think about life in our solar system and beyond. How is the Mars Science Laboratory getting to the Red Planet? Before Curiosity can get to work exploring the surface of Mars, it must first embark on a more than 8-month trip, starting from right here on Earth. But getting to the Red Planet is no mean task. Curiosity is scheduled to launch not three weeks after Russia failed its fourth consecutive Mars mission; getting to low-Earth orbit is challenging enough — setting a course for deep space introduces an entirely new level of difficulty. This photo, taken earlier today, shows Curiosity atop the Atlas V rocket that will be used to help the rover escape the gravitational pull of the planet, lifting it out of Earth's atmosphere and into interplanetary transfer orbit. Engineers at NASA's Jet Propulsion Laboratory have likened the rover's trip from Earth to Mars to a quarterback leading a wide-receiver on a hail-mary pass — only the "football" will be soaring through 354 million miles of interplanetary space, and will be entering Mars' atmosphere at around 13,000 miles per hour. Fortunately, unlike a football, the rover will also be guided by thrusters that will help ensure it's where it needs to be when it breaks Mars atmo. Once it does, however, NASA will be faced with the challenge of setting the rover down safely on the planet's surface. Landing the Mars Science Laboratory presents a uniquely difficult problem for NASA engineers; previous rovers have been small enough to make planetfall encased in inflatable airbags — Curiosity, by comparison, is simply too large for this landing method. Instead, the two-ton Mars Science Laboratory will be lowered with cables to the Red Planet's surface from a hovering, rocket-powered sky crane. Check the video on the left to see NASA's animation of Curiosity breaking Mars' atmosphere and making touchdown. See the low framerate imagery depicted starting at around 2:41? That's the kind of footage NASA hopes to acquire from MARDI (short for "Mars Descent Imager"), a small camera that will record the rover's descent to the Martian surface, and help the MSL team decide where Curiosity should set out to first upon landing. If the touchdown is successful — and NASA engineers are confident that it will be — it will be the first precision landing ever performed on Mars. Unlike its two most recent rover predecessors — Spirit and Opportunity — Curiosity is powered not by sunlight, but by a radioisotope thermoelectric generator. Translation? Curiosity is fueled by a ten-pound supply of radioactive plutonium. As the plutonium decays, it produces heat that is transformed by devices known as thermocouplers into around 110 watts of electricity. 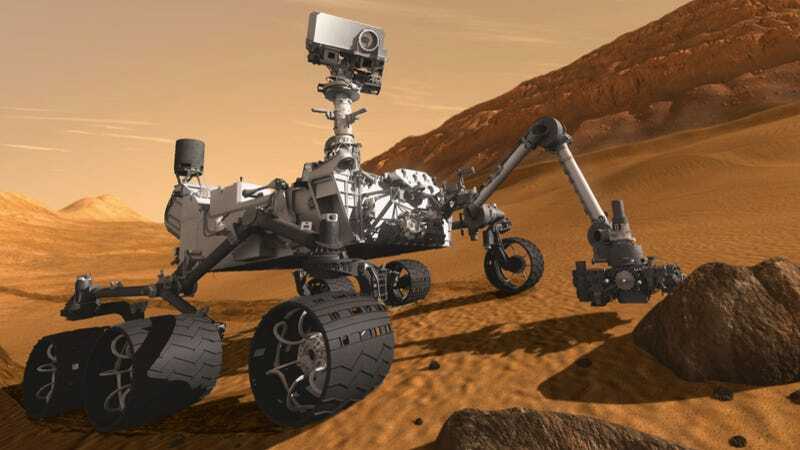 Once on the surface, this power will allow the six-wheel-drive Curiosity to turn in place, overcome obstacles up to 20 inches tall, traverse the Martian terrain at speeds of up to 300 feet per hour, and operate a suite of scientific instruments. The core of Curiosity's scientific payload is named Sample Analysis at Mars, or "SAM" for short. SAM comprises a mass spectrometer, a gas chromatograph, and laser spectrometer, which will be used collectively to search for elements in Mars' terrain and atmosphere that are associated with life here on Earth, including carbon-containing organic compounds, hydrogen, oxygen, and nitrogen. Supplementing analyses conducted by SAM will be an X-Ray diffraction and fluorescence instrument called CheMin (short for Chemistry and Mineralogy), designed to identify the minerals in Martian rocks and soils; the Alpha Particle X-Ray Spectrometer (APXS), used to determine the relative amounts of elements in Mars' terrain; and the Mars Hand Lens Imager (MAHLI), a focusable camera capable of capturing color images of subjects as tiny as 12.5 microns across — that's thinner than the width of a human hair. SAM, CheMin, APXS and MAHLI will all rely on a five-jointed, seven-foot-long robotic arm — pictured here — to conduct their analyses. However, many of the surfaces Curiosity encounters will likely lie beyond the rover's reach; and while curiosity's arm is equipped with a drill, it will only be capable of boring a few inches into any rocks it encounters. To ensure that it will be able to analyze these hard-to-reach samples, NASA has equipped Curiosity with an active/passive neutron spectrometer — called the Dynamic Albedo of Neutrons (or DAN for short) — and the ever-impressive ChemCam. DAN is situated near the back of Curiosity's main body, and is designed to help the rover search for ice and water beneath Mars' surface. By firing beams of neutrons into the ground and timing the speed at which they return, DAN should be capable of detecting the presence of water up to two meters beneath the planet's surface. Likewise, ChemCam uses laser pulses to vaporize thin layers of Mars' surface, and is capable of targeting soil and rocks from up to seven meters away. A spectrometer (used to identify the atoms that are vaporized by ChemCam's laser pulses) and a telescope (which will capture detailed images of material targeted by the beam) are situated atop the rover's mast, a position it shares with the Rover Environmental Monitoring Station (REMS) and the Mast Camera (MastCam). The former will serve as Curiosity's Martian weather station, while the latter is the rover's primary imaging tool. MastCam is designed to not only capture high-definition photo and video of the Martian landscape, it will also help the MSL team here on Earth identify points of interest on the Martian surface, and aid them in maneuvering the rover safely over the planet's landscape. Which brings us to the last item in Curiosity extensive scientific payload. The rover's Radiation Assessment Detector (RAD) will allow the MSL team to characterize the radiation environment at the planet's surface. NASA expects the data collected from the RAD to play a critical role in planning for future human exploration of the red planet, and determining the hazard posed by radiation to life, past and present, at and beneath the planet's surface. To call Curiosity a step forward in humanity's exploration of Mars would be a massive understatement. For as much as we've learned from the Spirit and Opportunity rovers in the last eight years, and for as attached to them as we have become, the scientific payload that Curiosity is packing has the potential to completely redefine, in a way no previous space mission ever could, the way we view ourselves — as a planet, as a species, and as a space-faring people. Curiosity is scheduled to launch tomorrow — Saturday, November 26 — at 10:02 Eastern (US) time (15:02 UTC). You can watch the launch live at NASA TV, or the NASA/JPL UStream channel.